And Then There Were None." > Nine Man's Murder by Eric Keith, a Mysterious Review. 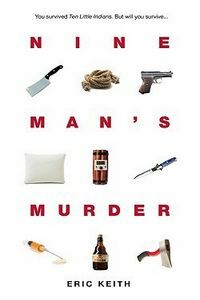 Review: With an affectionate nod towards Agatha Christie's And Then There Were None, Eric Keith weaves an intricate tale of murder at an isolated mountain estate in Nine Man's Murder. The plot of Nine Man's Murder is certainly familiar, but that does not detract in any way from the appeal of this book. The carefully crafted and meticulously detailed manner in which the story unfolds keeps readers in suspense as to "whodunit", almost from the very beginning. It's impossible to mention individual characters here without giving away key plot points, but all are treated nearly equally throughout — until they're dead, of course — allowing readers to form opinions as to their guilt or innocence as the story progresses. Readers might also want to keep in mind the book's title, which, not so indirectly, is also a subtle clue to the identity of the killer. Too, the X's that accompany the start of each chapter help keep track of how many of the original nine people remain alive. A minor quibble: the non-linear timeline that comprises the opening, introductory chapters is hard to follow. It's all relevant to the plot, to be sure, but it's not clear why the information is presented in this manner. Compensating for this to some degree is a useful list of the nine players in the "game", as it is referred to, and a floorplan of Moon's End; both are likely to be referred to often. Acknowledgment: Ransom Note Press provided a copy of Nine Man's Murder for this review.